UP SC ST 3000, General 2250 Scholarship Amount Hurry UP Friends and don’t mis the UP Board Scholarship because UP Government (Shashan) passed the letter to extend the date of Ninth nd Tenth Class Students. Samaj Kalyan Vibhag important secretary Manoj Kumar said in a meeting that instruction is mention in scholarship.up.nic.i, scholarship.gov.in. 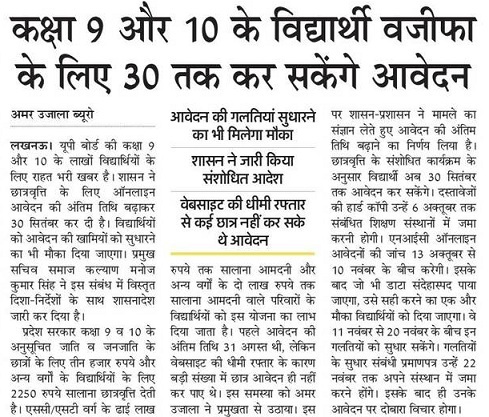 UP Government recently Slash on fees which are called Tuition fees for all students but good things are Govt has added some more money as scholarship Basis. On Current time SC ST Students Per annum received Rs 3,000. While General OBC Students received Rs 2250 per year. OBC General Students 2.5 Lakh Income Limit made. 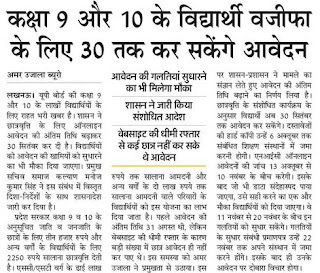 Last Date of UP Board Students Scholarship is 30th Students but first time it was 31st August 2018. Hard copy of Document Up may send before 6 October 2018. NIC Online Avedan Janch 13 October to 10 November 2018. Form Editing Date to make correction 11 November to 20 November 2018. Galti Sudhar Praman Patra 22 November 2018.